The parade will be held as scheduled even in the event of light rain. 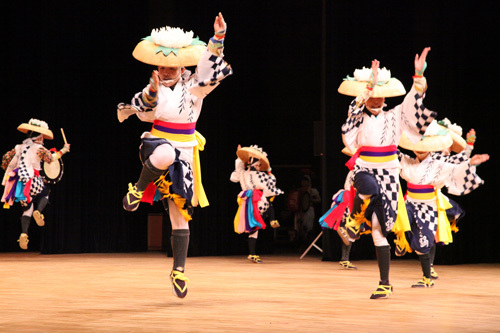 ‘Sansa Odori Dance’ originates from the ‘Mitsuishi Legend’. A long time ago, in Morioka castle town, an oni (demon) named ‘Rasetsu’ was terrorizing the local people. Being at a total loss as what to do, they prayed to the deity Mitsuishi-kami to rid them of the demon. Mitsuishi-kami heard their prayers, caught the demon and made him pledge to never trouble the people again by making the demon leave his handprint on the rocks located at Mitsuishi Shrine. This legend ‘Oni no tegata’ or ‘Demon’s handprint on the rocks’ explains the origin of the name Iwate (rock・hand). 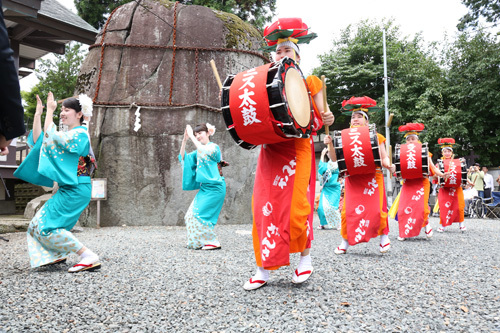 In addition, the locals rejoicing at the dispelling of the demon danced around the Mitsuishi Stones shouting ‘Sansa, Sansa’, which is also said to be the beginning of the ‘Sansa Odori’ dance. 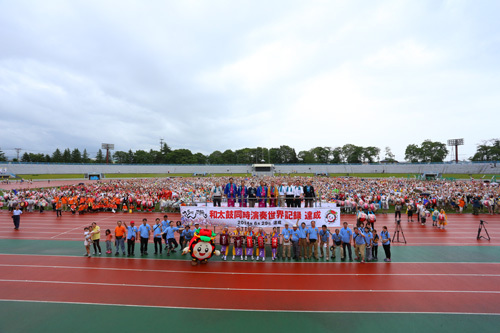 On June 29, 2014, many people of Morioka gathered at the athletics track of Iwate Prefectural Sports Park and attempted to win back the ‘World Record for Concurrent Performance of Japanese Drums’. Their previous world record attempt had been won by 2,571 people in Morioka City in 2007 but this had been defeated in Kumamoto City in 2011 by a slim margin of 207 people. In 2014, 3,437 men and women of all ages tried to win back the world record and finally succeeded with their wonderful performance with everyone in perfect synchronization, brought together by a strong desire for the reconstruction of Iwate, their homeland affected by ‘The Great East Japan Earthquake & Tsunami’. ‘Miss Sansa Odori’ dancers clad in a colorful kimono lead the parade dancing beautifully at its front. Each year, five beautiful and bright young single ladies are chosen as Miss Sansa Odori from the local population and they actively play an important role in exchange of friendship both inside and outside Morioka City throughout the year as well as the Sansa Odori Festival period. 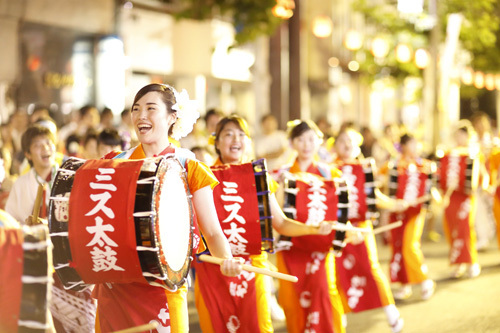 The ‘Sansa Taiko Group’, which colorfully enlivens the parade, consists of ‘Miss Taiko’, ‘Miss Yokobue’ and ‘Utakko-musume’, all of them festival aficionadas chosen from applications open to the local public. Their dynamic drumming and rhythmical flute-playing resound throughout the city. ‘Traditional Sansa Odori’ dances have been passed down since olden days in and around Morioka City. Each one varies from district to district in their arrangement of dancing and costumes, and it's well worth seeing every one of them. During the Sansa Odori Festival period, in addition to each day’s parade, you can see ‘The Traditional Sansa Odori Special Performances’ from various districts at other venues such as the Morioka Shimin Bunka Hall (Malios Bldg.) just west of the JR Morioka Station and Taki no Hiroba (JR Morioka Station Square). ‘Miss Sansa’ dancers and the ‘Sansa Taiko’ group are followed by a succession of large Sansa dancing groups of children as well as large numbers of dancers from local traditional Sansa groups, firms, district associations and schools. This dynamic and magnificent large parade performs before a large audience. Come! See! 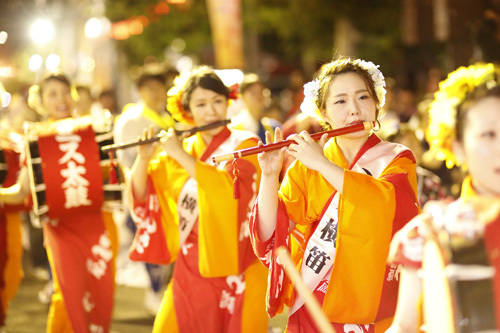 Be Fascinated by Sansa Odori and Join in! Only watching the ‘Festival’ is fun, but the true joy is in taking part with the members in the ‘Sansa’. ‘Sansa Oherense-shishō’, a dancing instructor in Sansa Odori, will gesture for you to join the parade while teaching you how to dance Sansa Odori. Jump in the day’s parade group ‘Ippan-sanka Sansa Group’ which anyone can join regardless of what you are wearing, and dance with us! ● Approx. 8:30 pm・・Wa-odori (Dancing-in-a-circle) starts successively in groups from in front of the Prefectural Government Building. Anyone, please freely join the Wa-odori. 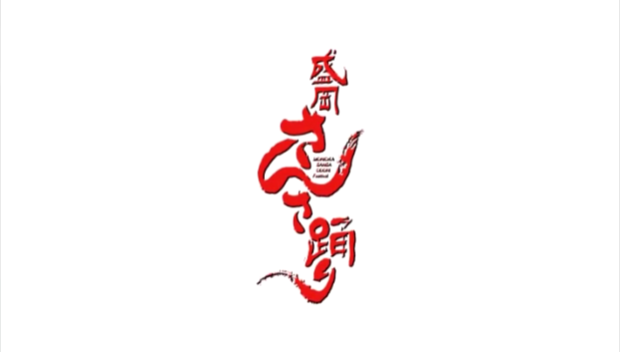 ※In case of cancellation due to heavy rain, Sansa Odori Dance performances will be held from 6:30 pm to 8:30 pm at Morioka Shimin Bunka Hall (Malios Bldg.) just west of JR Morioka Station. 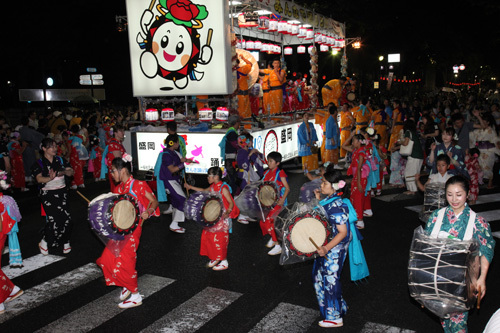 ● The large Sansa Odori Parade starts at 6:00 pm sharp. Miss Sansa dancers and groups of the Sansa drummers & dancers colorfully parade. The parade is enlivened by traditional Sansa group dancers, beautifully decorated floats and citizens’ dance groups. It’s really worth seeing. 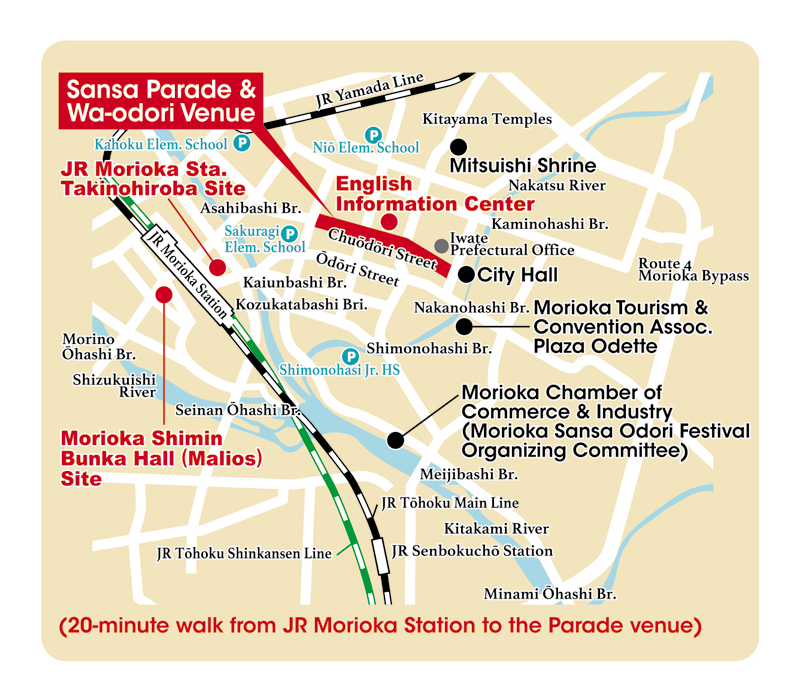 Wa-odori will be held at the seven sites along the parade route simultaneously. Anybody can join in and enjoy Wa-odori (Dancing-in-a-circle). 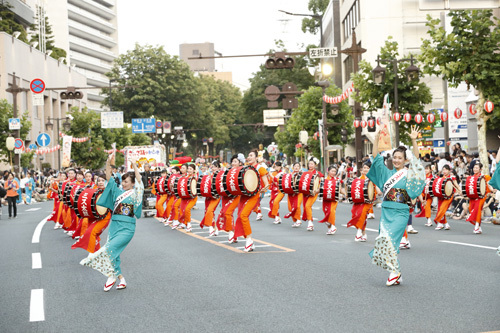 The Aug. 4th Parade includes the large drum parade registered as the world record and the large Wa-odori as the grand finale of the year’s Morioka Sansa Odori Festival. Interpreter-guides will be available for foreign visitors from 5:30 pm each evening during the Sansa Odori Festival period, at the general information center, near the midpoint of the parade route (just in front of Kita-Nippon Bank Head Office Bldg.) on Chuōdōri street. 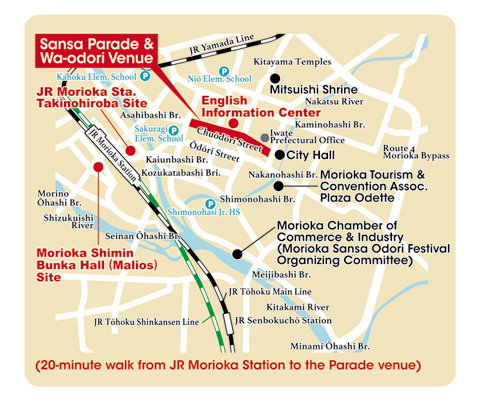 ● Admission tickets can be purchased at the following locations: the Sansa Odori Festival Organizing Committee, Morioka City Hall, Morioka Tourism & Convention Association, etc. ● You can see the traditional local Sansa Odori Dance performances, which have been passed down from generation to generation since the olden days. ‘Traditional Sansa Odori Dance Special Performances’ & Temporary Tourist Information Center at JR Morioka Station Taki no Hiroba Square. At JR Morioka Station Taki no Hiroba Square, you can enjoy the same ‘Traditional Sansa Odori Dancing’ as the ones performed at Morioka Shimin Bunka Hall without any admission fee. In addition, a temporary tourist information center will be open in front of JR Morioka Station. ● You will have a lesson of how to dance Unified Sansa Odori No.2 ‘Tanabata Kuzushi’. 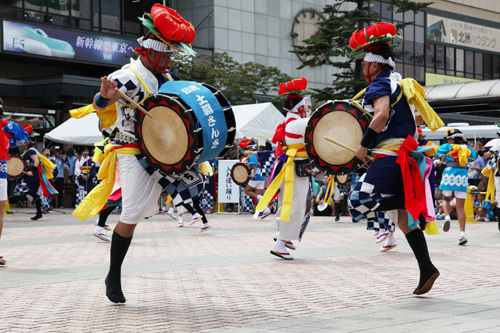 ※Learn here how to dance Sansa and participate in the day’s parade group ‘Ippan-sanka Sansa Group’ or Wa-odori (Dancing-in-a-circle).